The problem comes with scanning when you have one of the two new channels in between two old ones. So channel 118.410 is frequency 118.4083 and if you enter that in your scanner set to 12.5/25kHz spacing your scanner will be like “what the heck” and move it to the nearest step. However if it’s in 8.33kHz mode on the band Plan it will cope! Frequencies ending .#00/.#25/.#50/.75 are the old ones, 25kHz bandwidth/spaced, so the actual frequencies. .#05/.#10/.#15/.#30/.#35/.#40/.#55/.#60/.#65/.#80/.#85/.#90 and are 8.33kHz bandwidth/spaced so you need to look up the actual frequency. The Gold Standard Transponder Mode with more features above Mode S. Along with that data they crucially send their GPS location. These aircraft can then be plotted on a map without the need for multiple receivers on the same network in different locations. These are used mainly by Airliners and some of the newer military Aircraft. Automatic Terminal Information Service: An looped voice recording of airfield and weather information available to pilots on a separate frequency. This means they can get airfield information inbound or before startup without having to use an Air Traffic Controller or waste time on a main frequency. It will remain the same recording on a loop until a new one is issued, it will be prefixed with the time of issue and a letter number ie “Information Code Alpha, timed at 0800 Zulu.” When an Aircraft hands over the controller will normally ask: “Do you have information Code Alpha?” If not or if they have a previous ATIS Code the controller will normally update them on that frequency with the latest information. Aerodrome Traffic Zone, an area depicted on charts around an airfield. It extends to 2,000ft above Aerodrome Level (AAL) with either a 2nm or 2.5nm radius depending on the length of the longest runway. Amplitude Modulation: A Modulation Type. Airband is nearly always in AM. Technically it’s the modulation of a wave by varying its amplitude. A Minimum Fuel state, calculated so that if the aircraft has not been cleared to land by, it should divert to the designated diversion airfield, in order to have enough fuel left to land at minimum landing fuel. Stands for Bearing, Range, Azimuth, Aspect and is used for relaying the location of a Contact, from the position of either bullseye or the receivers position. An example from Bullseye for the following…. Combat air patrol (CAP) is a type of flying mission for fighter aircraft. A combat air patrol is an aircraft patrol provided over an objective area, over the force protected, over the critical area of a combat zone, or over an air defense area, for the purpose of intercepting and destroying hostile aircraft before they reach their target. Combat air patrols apply to both overland and overwater operations, protecting other aircraft, fixed and mobile sites on land, or ships at sea. Height in hundreds of feet. For Example 10,000ft is FL100. Due to Aircraft using Air Pressure to work out height they use a Standard Pressure Setting of 1013hpa to ensure they are all on the same setting when they are all using “Flight Levels.” For this reason it is rarely the actual height above the Ground or indeed Sea Level as Air Pressure goes up and down depending on the weather conditions. For these reasons only aircraft over a certain height fly at Flight Levels, this height is called the Transition Level. Frequency Modulation. A modulation type, Airband is nearly always in AM instead. FM tends to be used for ground handhelds only and not to or from an aircraft. Technically it is the encoding of Information in a carrier wave by varying the instantaneous frequency of the wave. Ground-controlled interception: An air defence tactic whereby one or more radar stations or other observational stations are linked to a command communications centre which guides interceptor aircraft to an airborne target. General Handing: General flying manoeuvres in a given area, normally assigned, or in a requested altitude block. Instrument Landing System: A Precision approach method relying on complicated ground equipment to provide an aircraft on approach a picture of where it is in terms of glideslope and centreline. It also provides a distance measure at significant points as the aircraft passes over Markers. Pilots do not need to see the ground until at the minimums set for that class of aircraft. Due to it being a precise method of navigating it can help pilots land in bad weather are not required to see the runway until a lot later and lower in the Approach than normal. A Callsign used by AWACS Controllers to control aircraft. Often referred to as the “Backseaters” in an AWACS as the Flight Crew will operate under a different Callsign with an ATSU, often under “NATO” Callsigns. Military Air Traffic Zone: An area depicted on charts around a military airfield. It extends to 3,000ft above Aerodrome Level (AAL) and has a radius of 5nm. An additional area of the MATZ with a width of 4nm, extending a further 5nm along a final approach path for main instrument runways and extending 1,000ft to 3,000ft above Aerodrome Level. An Actual Meteorological (Weather) Report published electronically from an Airfield. Usually every hour and usually Automated, it’s a snapshot of the weather at a certain time. It is given in a form of abbreviation/shorthand that can be difficult for the average person to understand but many apps and sites will “decode” this information to make it easier to interpret. A Military Transponder Mode that automatically replies electronically to interrogation with a 2-digit 5-bit mission code entered into the Transponder by the pilot. Transponder Mode that automatically replies electronically to interrogation with a 4-digit octal unit code. Technically Mode 3C is a Transponder Mode that automatically replies electronically to interrogation with the aircrafts pressure altitude (Set to SPS 1013.2hpa) it is often combined with Mode A as a Mode 3A/C Transponder. Combines mode A & C replies. These transponders are generally used in General Aviation Aircraft as they are one of the more basic Transponder modes, with Mode S and ADSB offering more features. Generally speaking Mode 3A/C Transponders can not be tracked because they don’t offer any “identification code” unique to one aircraft. The same Squawks and indeed same altitudes could be coming from another aircraft so it’s hard for tracking websites to be sure if it’s one aircraft or more they are getting data from. An enhanced Transponder Mode with more features above Mode 3A/C. Along with that data they crucially send their identity in the form of a Hex Code, with these code ranges allocated by the ICAO internationally and can be looked up on a database to get aircraft information such as Registration/Serial. Therefore computers can, with reasonable certainty, know which signals are coming from that one aircraft. We can then track them by working out their location by MLAT. However it’s crucial to understand Mode-S Transponders do not send their location out like ADSB Transponders so this MLAT calculation will generally need to be in range of 5 receivers on the same network to locate them. Mode-S Transponders span General Aviation, Military and Light or Older Commercial Aircraft. A Military Transponder Mode that automatically replies electronically to encrypted interrogation with a 3 pulse reply. A Military Transponder Mode that uses encryption and automatically replies electronically with, essentially, a secure version of Mode/S and ADSB. National Air Defence Operations Centre, based at RAF High Wycombe. Responsible for the Defence of the UK’s skies. They receive intelligence from the CRC’s and are the people who will speak to the Designated Government Minister, briefing them on the threat and receiving their instructions. NOTIce to AirMen: A Notice of occurances that May effect air activity in a given area. Primarily for flight safety users but to aid in coordination between air service users. As Open Source Information it can be useful for Enthusiasts to gain more information about an event like time, location or Route. They often use an agreed set of abbreviations sometimes making them difficult to interpret. Out of Season Display: A display practice outside of the display season, prior to PDA. Often described as “workup” they may contain parts of the display sequence, the full sequence, or at higher heights before being stepped down to display height. Precision Approach Radar: A Precision approach method relying on dedicated RADAR that can measure where an aircraft is on the Approach in terms of distance glideslope and centreline. A Talkdown Controller Can then give the Pilot this information, alongside corrections to talk them down on approach. Pilots do not need to see the ground until at the minimums set for that class of aircraft. Due to it being a precise method of navigating it can help pilots land in bad weather are not required to see the runway until a lot later and lower in the Approach than normal. Practice Diversion to another airfield to perform one or more approaches. Often used in terms of a “PD Booking” where a sortie has pre booked a PD to perform one or more approaches at the respective airfield. Public Display Authority: The Authority required to display to the Public or at an pre-organised gathering. This process usually takes place on a specific day following, often months of practice. A senior nominated military commander will observe a display pilot perform a display, but also assess their briefing processes and standard operating procedures to ensure that they are primarily safe to display but also fit to represent the organisation they are representing. Unless PDA is gained a military display team can not display to the public, they may however perform flypasts that do not consist of aerobatic manoeuvres. Air pressure at Aerodrome elevation. To be entered into an altimeter so it so shows aircraft height above the Airfield elevation. This is used for landings, takeoffs and circuits as when on the ground the altimeter would read (approx) 0ft and otherwise height above aerodrome level (AAL). Air pressure at mean sea level (MSL). To be entered into an altimeter so it shows aircraft altitude above MSL, as altimeters work off air pressure. Good for terrain avoidance when flying low as ground and ground features (Masts etc) are shown in chart in AMSL (Above Mean Sea Level) For a QFE Approach you need to know the Airfield Elevation as your altimeter won’t read 0ft on the ground with QNH set, it will read the airfield elevation at that point on the ground. For this reason approaches are normally flown on QFE. Red Arrows use Mode A/C transponders most of the time which can’t be tracked. Jet XX242 has Mode-S which can be tracked at a reasonable altitude with an MLAT network such as 360radar, however it’s only on a handful of times a year unfortunately, so it will show, just not often. The Aircraft Hex Code (Unique ID) is within the UK Military Range and a lot of commercial Civil Aircraft tracking services block out that block of codes. I have seen it show on some but it’s unclear if they have allowed it through on a one off basis or as a more permanent exclusion to their usual military blocking policy. You may also see “RED10” on a Juno (Previously Squirrel) Helicopter used as a Shuttle for RED10 back and forth to Display sites in season for commentary etc. The easier transponders to track ADSB/FLARM are not carried. Essentially a receive only radio designed to search a list or range of frequencies really quickly and stop on an active frequency allowing to to hear to transmission. If you are looking to purchase one ensure if covers the Military (UHF) and Civil (VHF) Airbands at a minimum. As they get more advanced they become faster and offer better features such as being computer programmable/controllable. A NATO brevity Codeword meaning: An interrogated group/Radar contact which lacks the Air Tasking Order established (or equivalent) IFF Modes and codes required for identification criteria. Survalence Radar Approach: A Non Precision Approach by using the normal Survailance Radar to give a controller a picture of where the aircraft approaching is and allows to pass on this information and correction to Pilots over the Radio. It is similar to a PAR but less precise. It aids the Pilots in bad weather as they do not have to be visual with the runway throughout the Approach, there will be set minimums at which the Pilot needs to become visual with the Runway to complete the Approach, but as it’s not as precise as a PAR approach using dedicated Radar for this purpose a pilot needs to become visual further out and higher up than a PAR or ILS approach. Tactical Air Designators, Frequencies for the tactical control of air assets. In the UK TAD’s are managed by the CRC’s and allocated to Taskings. They are generally assigned three digit numbers, such as “TAD 140” to avoid having to give the actual frequency over the air. A UHF Radio Navigation Beacon providing distance and bearing information for Navigation. TACAN is a military system for Radio Navigation accepted as being more accurate than its civil equivalent. The Beacons are mainly located at Airfields as Static beacons however they can also be located on Ships or Aircraft. Terminal Area Forecast. A weather forecast electronically published by an Airfield. It is published in a form of abbreviation/shorthand that is difficult to understand however most apps and websites will “decode” the information to make it easier to interpret. Air refuelling Aircraft. The RAF use Callsigns MADRAS/TARTAN Number Should be Day of Week then Sortie Number. NATO brevity codeword for the Link 16 Data Link System. Is a device in the cockpit that automatically replies electronically to interrogation with certain information, depending what it is asked for and what modes it is equipped with (See Modes 1 to 5) now “extended squitter” Transponders are becoming cable of sending information without even being asked. Visual Flight Rules. A set of rules of the air that allow you to fly and navigate by visual clues in better weather (See VMC) essentially the Golden Rule is to see other aircraft and avoid them, rather than allowing on Rules, instruments and Air Traffic Controllers to keep you out of trouble. Crucially you are not allowed to fly in certain classes of controlled airspace to VFR. VFR are the basics of flying and allow Pilots to qualify as a Pilots but be restricted to these rules in better weather. Very High Frequency: Technically any frequency between 30MHz & 300MHz. However when we talk about VHF Airband we generally mean just the Airband portion of this which is 118MHz to 136.975 MHz. This can also be called Civil Airband as it’s Mostly Civil Aircraft that use it although Military Airfields and Aircraft will use VHF Frequencies too. When discussing a VHF radio on Airband, they may refer to VHF frequencies as “Victor” Frequencies. 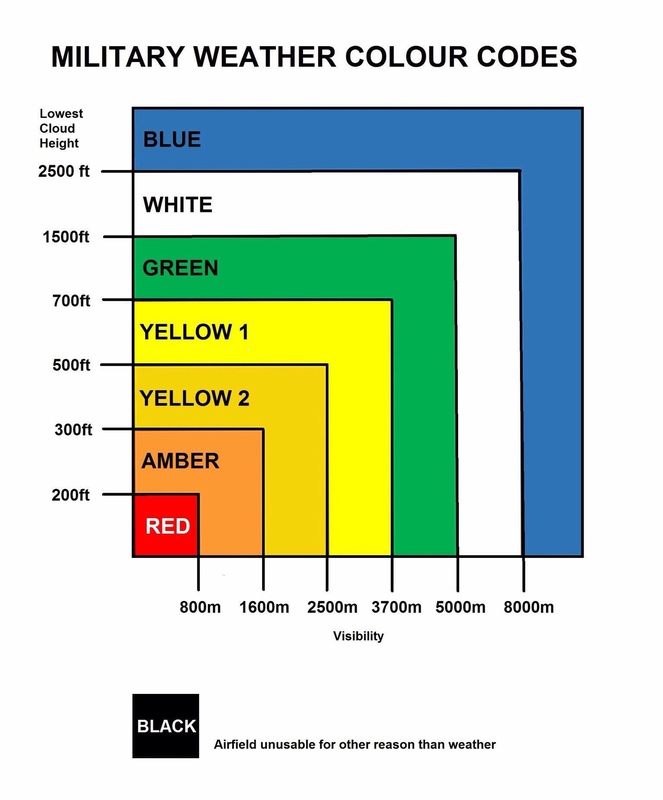 There is also a VHF Low Band which is far less commonly used which is probably around 30MHz to 87.975MHz.